Prof Dr Amjad Mahmood graduated from de’Montmorency College of Dentistry/Punjab University, Lahore, in 1983 and worked as a general dentist in public and private sectors and also in Sultanate of Oman and UK. He did his fellowship (FDS RCSEd) from the Royal College of Surgeons, Edinburgh, UK, in 2002. He worked as Consultant Orthodontist, Head of Orthodontics Department and Supervisor Postgraduate Programme at KRL Hospital, Islamabad for more than 7 years. Since 2010 he has been working as Head of Orthodontics Department at the Margalla Institute of Health Sciences, Rawalpindi, supervising undergraduate as well as postgraduate students. His current charge is of Principal, MIHS, Rawalpindi. He is registered with PMDC (Pakistan Medical & Dental Council) as a Dentist and Orthodontist. He is a member of WFO (World Federation of Orthodontist). He is founder member and past president (two tenures) of PAO (Pakistan Association of Orthodontists). He is undergraduate & postgraduate examiner for many universities and examining bodies of Pakistan, including CPSP (College of Physicians & Surgeons Pakistan). He is member faculty of Orthodontics of CPSP. He also runs orthodontic courses for general dentists. He has more than 20 publications and has also supervised more than 20 dissertations. He also happens to be the Chairman, Research & Ethics Committee of Margalla Institute of Health Sciences, Rawalpindi, Pakistan. He was the founder and First editor-in-chief of POJ (Pakistan Orthodontic Journal). He has attended many national and international conferences, workshops and courses. He has also lectured and conducted orthodontic courses workshops in many conferences. Dr. Nisar did his B.Pharm in 1981 from B.Z. University Multan and M.Pharm in 1985 from the University of the Punjab, Lahore. He completed his PhD (Pharmaceutics) in 2003 from School of Pharmaceutical Sciences, the University of Science Malaysia. In PhD he won Merit Scholarship by the Malaysian Government. He won Post Doctoral Fellowship Award 2007 by Higher Education Commission, Islamabad, Pakistan. He has more than thirty years professional and research experience. He served Multinational Pharmaceutical company Rhone Poulenc Pakistan Ltd. (Presently Aventis) for seven years. 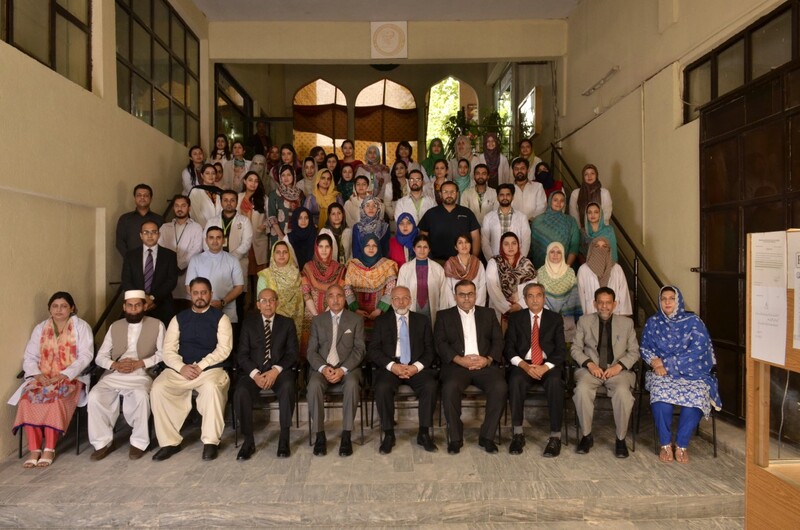 He contributed in the Department of Pharmacy, The Islamia University of Bahawalpur and COMSATS Institute of Information Technology, Abbottabad as Professor and Chairman. He has supervised more than fifty MS/MPhil students and six PhD scholars. He has more than 70 research publications in reputed International and national journals with good impact factor. He is MPhil and PhD thesis evaluator of national and International universities. He joined Margalla college of Pharmacy as Dean and Professor. He is focal person of Pharmacy council of Pakistan and committed for promotion of Pharmacy education. Dr. Muhammad Nazim Farooq completed his graduation in Physiotherapy from School of Physiotherapy Mayo Hospital Lahore in 2000. He then completed one year additional course in Physiotherapy for 4 years (BSPT) degree from Jinnah Postgraduate Medical Centre (JPMC) affiliated with University of Karachi. He travelled to UK and enriched his qualification by completing a Certificate in Spinal Manual Therapy in 2007 at Oxford Brookes University. He then went to Birmingham and further enhanced his qualification by earning Master of Science in Advanced Manipulative Physiotherapy in 2009 from University of Birmingham, UK. Nazim joined Islamabad College of Physiotherapy, Margalla Institute of Health Sciences Rawalpindi in 2009 as a HOD/Assistant Professor. He has 16 years of clinical experience both in Pakistan and UK and 7 years of teaching experience at the undergraduate and postgraduate level. He has provided his services as a visiting faculty member in different well known institutions in Pakistan in particular Riphah College of Rehabilitation Sciences, Riphah International University, Islamabad, Isra School of Rehabilitation Sciences, Isra University, Islamabad Campus and Ace Institute of Health Sciences, Lahore. He has also worked as a deputy chief proctor at Margalla Institute of Health Sciences Rawalpindi. Nazim is an experienced musculoskeletal clinician and is a member of the Musculoskeletal Association of Chartered Physiotherapists (MACP) UK.